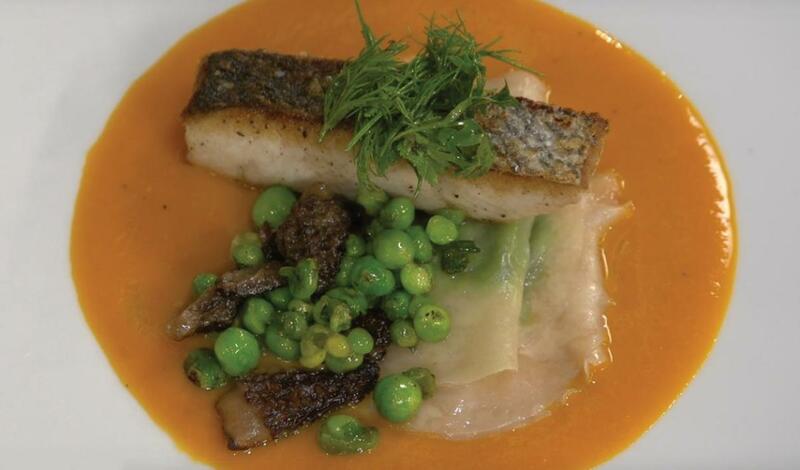 Seared sea bass in a light puréed carrot and ginger sauce, garnished with morels and peas for a colorful taste of spring. Sprinkle both sides of the sea bass with salt and sugar. Place in refrigerator to cure for 30 minutes. Add the carrots, ginger and carrot juice to a sauce pan. Add the prepared Knorr® Professional Liquid Concentrated Vegetable Base and bring to a simmer. Once the carrots are tender, add the mixture to a blender and puree until smooth. Add a little carrot juice to thin out if needed. Pour the pureed mixture back into the sauce pan and bring to a simmer. Add salt, pepper, and lemon juice, adjusting seasoning to taste. Set aside. Place the blanched, pureed peas in a bowl and add the mint, salt, and pepper, adjusting seasoning to taste. Place the mixture into pastry bag. Set out wonton wrappers and brush edges with egg wash. With the pastry bag, pipe out a small amount of filling into the center of 12 wonton wrappers. Place the top of the wrapper on and press firmly on the edges to seal. You can use a fork, or ravioli press. Boil the ravioli until cooked through. Strain and toss with a little butter. Rinse sea bass and pat dry. Season with salt. Pan sear sea bass on both sides in olive oil. In another sauté pan, heat oil and add morels and cook until tender. Add fresh peas and sauté until cooked. To plate, add Carrot and Ginger puree to bottom of dish, add three ravioli, and place fish on top. Spoon sautéed morels and peas over the fish. Garnish with tarragon, carrot tops and dill, and a squeeze of lemon juice.